We had 2 hours before and 2 hours after lunch in workshop at the RWA without any breaks, how does she manage to stay so still? 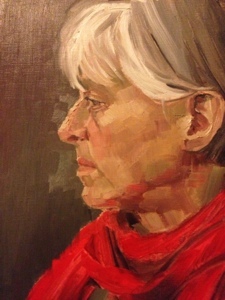 Slight downside to having no breaks – less chance to chat to fellow painters and nose at their work. After a bit of sketching I decided to spend the rest of the time on a single study. Zorn palette again, red,black,ochre,white. I was using flats for the portrait and was maybe slightly thinking of the Simon Davis portraits I’d seen in the week. A real bonus was free entry to the current Reigning Cats and Dogs exhibition Pretty much 50% of the dogs featured were whippets, greyhounds or lurchers so I’ve absolutely no excuse for creating work based on the dogs. Fantastic to see the bronze greyhound sculptures that I admired a few years ago too. Still can’t afford them though! This entry was posted in recent work and tagged Bristol Drawing School by ianpriceart. Bookmark the permalink.